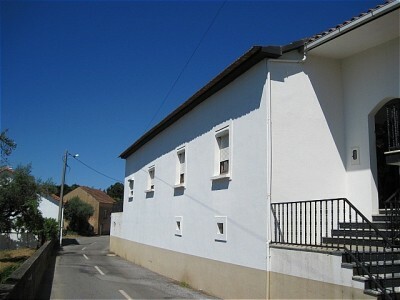 A two storey detached house with garden for sale near Serta in central Portugal. The property, which measures 155 square metres of construction has a garden measuring 1,050 square metres. The property is connected to both mains water and electricity and has a variety of mature fruit trees in the garden. The property is in a habitable condition and is set over two floors, though the living accommodation is situated on the first floor. The property has wooden framed windows and integral roller shutters. The property benefits from a diesel central heating system and is in a relatively good decorative order. The main entrance to the house is via a set of marble faced stairs to the front of the house. This leads into a central hallway, which has a tiled floor. Off this hallway there are three bedrooms, all of which have tiled floors. There is a spacious partially tiled bathroom which has a bath with shower above, toilet, bidet and pedestal sink. There is a spacious living room at the end of the hallway, which also has a tiled floor. The living room provides access to the kitchen, which has a variety of built in base and eye level wooden units with granite work surfaces. The oven and hob are integral as is the extractor fan. The kitchen also has a brick, central fireplace and space for a dining table. The property also has a spacious attic, which has a concrete floor and wooden beamed roof. At present this space is being used as storage, though could be converted into additional living space with a little work. The ground floor accommodation has a concrete floor and is accessed at the rear. The ground floor accommodation is currently open open space and is being used as an entertainment area and wine store by the present owner and a garage. There is a large sliding vehicle access door to this room and could be subdivided easily. There is a single storey storage building adjacent to the house which has a concrete floor and a built in bread oven and barbecue and the present owner is utilising this as a summer kitchen, though could be converted into a spacious laundry room. The property has a garden measuring 1,050 square metres, which is located to the rear of the house. There is a variety of mature fruit and olive trees as well as flowering shrubs. The property is connected to both mains water and electricity though also benefits from a well for irrigation of the garden. The property is situated in the village of Cabeço de Cima and is within walking distance of a cafe and mini-market. The larger town of Serta, which has a variety of shops, cafes, restaurants, supermarket, health centre, vets, banks, school and parks is around 10 minutes drive from the property. The closest airport to the property is located at Lisbon, which is around two and a quarter hours by car. Lisbon airport is serviced by a variety of low cost airlines, which operate regular flights into and out of the United Kingdom.